AVAST Software, maker of the most trusted antivirus in the world, avast! 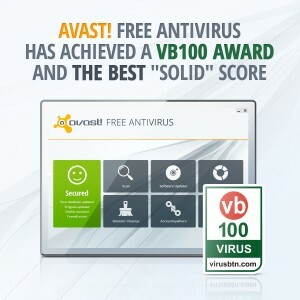 Free Antivirus, has achieved a VB100 award in the latest Virus Bulletin VB100 comparative review. The VB100 award is given to those products that detect 100% of viruses “in the wild,” using the freshest malware sample sets available, as well as samples not previously seen. In this round, the testers also used a range of items including a wide selection of educational software, designed for use either in schools or in home-teaching environments. avast! Free Antivirus scored 100% for each malware set tested. “The core sets were dealt with flawlessly, easily earning Avast a VB100 award for this month’s efforts,” said the Virus Bulletin experts conducting the test. The second standard measured is the number of false positives generated when scanning. A false positive warning happens when a file is erroneously tagged as a virus or malware, when in fact the file does not possess such malicious code and is not a virus or malware. avast! Free Antivirus had zero false positives and got a perfect score on both standards showing it has what it takes to handle newly emerging malware and accurately detect previously unknown malware. Speed and performance measures are also taken and avast! Free Antivirus earned the highest Stability rating, Solid: No issues observed, as opposed to Stable, Fair, or Buggy. The Virus Bulletin annual conference, the premier technical event of the antivirus/security industry, will be held the first week in October in Berlin. AVAST will be attending, so we hope to see you there.